BIG TENT EVENTS: can provide everything needed to have your special event under a tent at an affordable rental price. Invite the guest and we'll take care of the rest. We are the local rental company you can count on when you need to rent wedding tents tables and chairs, party tents, canopy tents, event tents and much more quality party rental equipment for all of your party and event rental needs. No event is ever considered too large or too small, let our experienced event planners help you with your party planning. We will work with your caterer, wedding planner, corporate event planner or future mother-in-law to ensure that everyone is pleased with the final product and has their rental needs taken care of by our courteous and professional staff. Fall Wedding Tents - Outdoor Wedding Receptions allow you to create an outdoor banquet hall under a tent. Wedding tent rentals offer the ability to personalize your wedding ceremony and reception through the rental of tables, chairs, linens, lighting, fabric leg drapes or a beautiful pleated frame tent liner to conceal the skeleton-like frame. Big Tent Events can make your outdoor wedding dreams a reality. The typical fall wedding colors like purples, browns and gold will always be popular palette choices, but this season event designers are pairing those classic colors with vibrant jewel tones. Also in this year - All-white weddings with a hint of color like chartreuse, blush or even lavender. Festival Tents - Festival and Event Tent rentals can greatly enhance the appearance and attendance of your event, festival or fair by protecting vendors and guests from the unpredictability of Mother Nature and can be installed on most surfaces. Our festival frame tents are available in a variety of sizes ranging from 10' x 10' to infinity. We carry several styles of tents and canopies for festivals and other outdoor events. 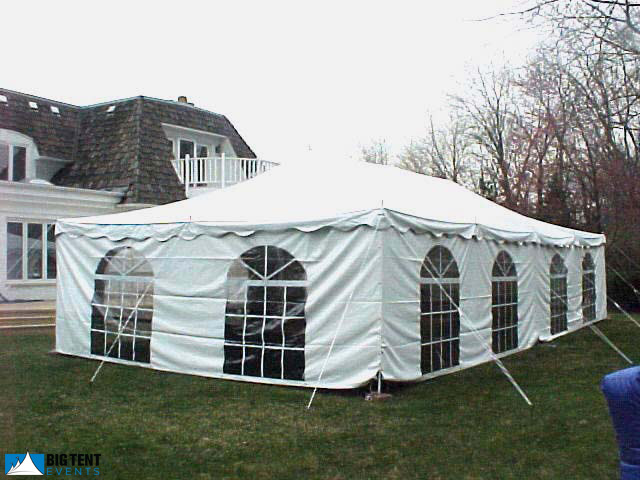 Party Tents- Party and canopy tents are a great addition to any outdoor event. Our party tents and canopies are available in a variety of color and sizes ranging from 10'x10' to 20'x40'. We offer Do-it-Yourself canopy tents that must be setup in grass. Our Do-it-Yourself packages offer clients affordable party tent rental prices without giving up quality. If you prefer we can do all the work so you can sit back and enjoy your backyard party. Check out our internet specials. Frame Tents - Our Event Tent rentals are white frame tents. Frame tents have a skeleton-like structure that allows them to be setup on almost any type of surface. If stakes can not be used to secure the tent, water barrels will be used. Frame tents are preferred by many clients as a rental tent because there are no center poles leaving an unobstructed and open space under the tent. Frame tents are the perfect patio or deck tent. Event tents are available as small as 10 x 10 and as large as 40 x 120. Larger tents are available, please consult with your event planner for larger sizes. Tables - Our wood top rental tables come in a variety of sizes and shapes. Choosing the right table can reduce the amount of space needed. 60 inch Round Tables are the event industry standard for seating and the best choice for formal occasions. 8 Foot Banquet tables are often used to maximize dinner seating under a tent or as buffet and caterer prep tables. High Boy Tables are used for cocktail hour at special events such as weddings , after hour events or when a full meal is not being offered. They look amazing with linens draped over them in a color coordinated to your event. Visit our tables page for more sizes. Chairs - Chair rentals are an important part of your event. Finding the right chair rental for the right price is important. We offer chair rentals in a variety of styles and colors. Classic Chiavari Ballroom chairs offer a timeless elegance to any indoor event. Dark wood garden folding chairs bring a touch of warmth and beauty to a party. White resin garden chairs are a light weight alternative to their hard wood counterparts. Plastic contoured folding chairs with molded plastic seats and backs are affordable, comfortable and can be used indoors or out. Tent Packages - All Frame Tent Packages include: Frame Tents, Tables, and Chairs, Setup and Teardown. We setup the business day before your event and takedown the next business day after your event. Package pricing does NOT include delivery costs. Delivery costs are based on distance traveled. Do-it-Yourself Party Tent Packages include: Each Party Tent comes complete with aluminum poles, steel stakes, guy ropes which are permanently attached to the tops to prevent misplacing them and to allow for simple yet fast installation adjustments, storage bags and illustrated step-by-step installation instructions. Installs in 20 - 60 Minutes depending on the size of the tent. Rope Slides Make Adjustments Simple. Lightweight Vinyl. Grass Installation ONLY. Pick up your equipment from us on Thursday and return it Monday. Heated Tent Rentals - Winter temperatures in the Midwest can get down right freezing. However, that does not stop tents from being used. To use a tent in the fall and winter, we enclose the tent with sidewall, install propane heaters outside the tent with ductwork which goes into the tent and place the thermostat to control the temperature. Heated tent rentals are perfect for decks and patios. Click Here to learn more about Heated Tents. We service the following States on a case by case basis: Indiana, Wisconsin, Iowa, Michigan.